I'm going with one of my guilty pleasures tonight — prompted by the sad news that Greg Lake, one of the founding members of King Crimson and Emerson, Lake & Palmer, died yesterday at the age of 69 after “a long and stubborn battle with cancer.” This news comes nine months after the the suicide of his bandmate, Keith Emerson. As many of you know, I make no excuses for a life-long love for certain genres of music that causes some folks to cringe. What can I say? I grew up on a steady diet of heavy metal, prog, glam and classic rock before punk and new wave ripped it all away. (And forget classical, jazz and the blues… it would be years before I was truly capable of appreciating and understanding that kind of music; despite, of course, heavy metal's indebtedness to the blues and the undeniable homage prog rock pays to both jazz and classical music). Ahh prog(ressive) rock… the more keyboards that look like an old time telephone switchboard molesting a piano, the better. The more rotating drum kits featuring an orchestra's worth of percussion played by one man, the better. The more costumes, sound effects, slide shows, unusual time signatures, and introspective, quasi-spiritual lyrics, the better. In the mid-to-late 70's I probably saw Emerson, Lake & Palmer perform live a half dozen times. That was back in the day when rock concert = spectacle and shows were well worth the price of admission. Keith Emerson didn't play his keyboards, he attacked them—or was attacked by them. And yet, in true prog rock fashion, he was also one of the first rock musicians I know to record an original piano concerto that spanned the entire side of one of the band's records. Carl Palmer didn't just keep the beat, he seemed to fuse with his kit in a sweaty, zen-like work-out. 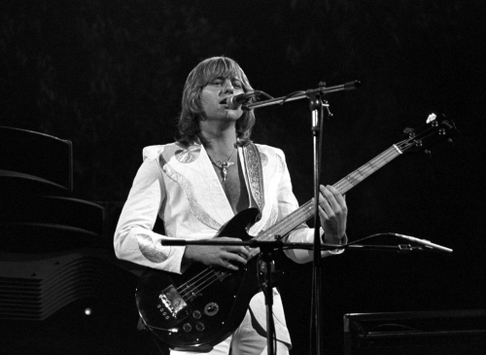 And then there was Greg Lake. The odd man out to me; calmly standing atop an anomalous oriental rug — far from the whirling madness of the other 2/3rd's of the band. Lake played electric bass and acoustic guitar without ostentation or glitz. But he was the singer, and he wrote the lyrics and, as you know by now, I've always been a sucker for a good choice of words. 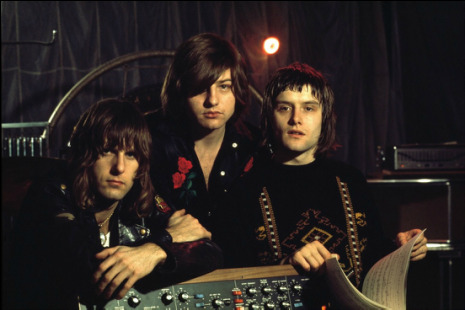 ELP was always a little schizophrenic, but I think that's the nature of prog rock in general. Bombastic and over-the-top one minute, haunting and beautiful the next. On the band's first album, three of the six tracks were instrumentals, including “The Barbarian,” an Emerson arrangement of the 1911 piano suite Allegro barbaro by Béla Bartók. “Knife-Edge” is based on the first movement of Sinfonietta by the Czech composer Leoš Janáček that features a passage from the Allemande of French Suite No. 1 in D minor by Johann Sebastian Bach. Palmer contributed “Tank,” a seven minute drum solo, and Lake recorded “Take a Pebble” and today's Happy Medium Song of the Day, “Lucky Man,” an acoustic ballad he wrote with his first guitar at the age of twelve. Even though it feels like I could easily spend what's left of the 2016 writing about all the amazing musicians who have died this year--David Bowie, Leonard Cohen, Prince, Glen Frey of The Eagles, Sharon Jones, Mott the Hoople's drummer Dale Griffin, Leon Russell, Paul Kantner of the Jefferson Airplane, and Maurice White of Earth Wind & Fire, to name a few—fear not! Death will not be the sole impetus for the music I choose to write about in the coming weeks. Afterall, the universe seems to have a knack for providing a counterbalance of birth or rebirth for every passing of one of my rock n' roll heroes... Ain't that right Mick and Keith? Ain't that right Jim and William Reid?